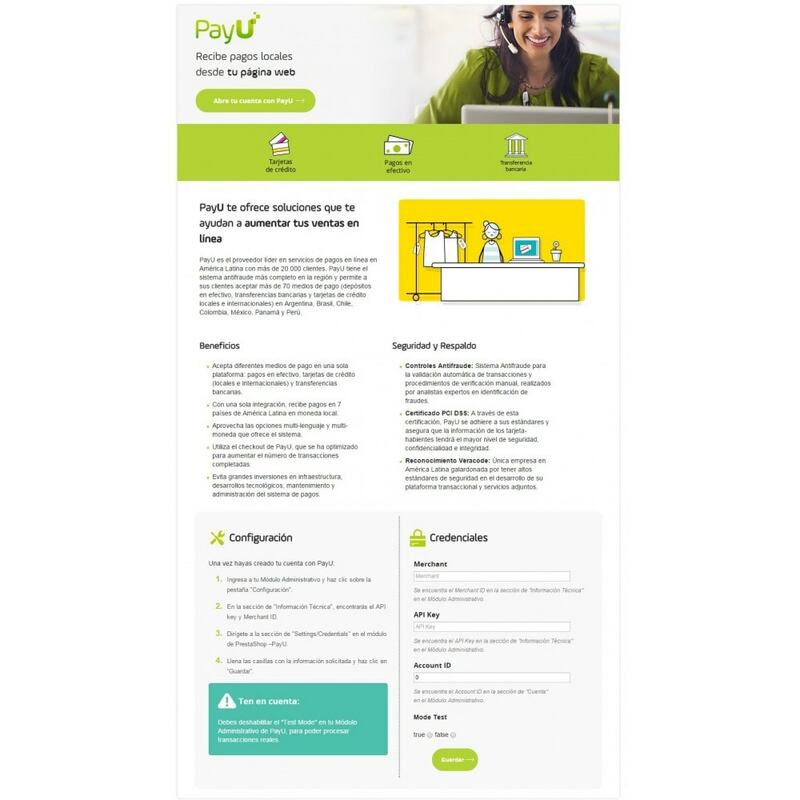 PayU Latam is the leading online payment service provider in Latin America with more than 20,000 clients. PayU Latam’s multi-language and multi-currency platform has the most complete anti-fraud system in the region. The 70+ payment options allows its clients to reach the entire market with cash deposits, bank transfers, and local and international credit cards in Argentina, Brazil, Chile, Colombia, Mexico, Panama and Peru. Whatever the size of your business, we have solutions to help you grow it. With a single integration, you can receive payments with all payment methods we offer. Trust PayU to ensure the security of your transactions with our anti-fraud system, so you can focus on your business. Multi Language and Multi Currency Module – the PayU Module is available in English, Spanish and Portuguese as well as the currencies of Argentina (ARS), Brazil (BRL), Chile (CLP), Colombia (COP), Mexico (MXN), Panama (USD) and Peru (PEN). If you have any technical related questions, please send an email to ​sac@payulatam.com with you PayU Merchant ID. 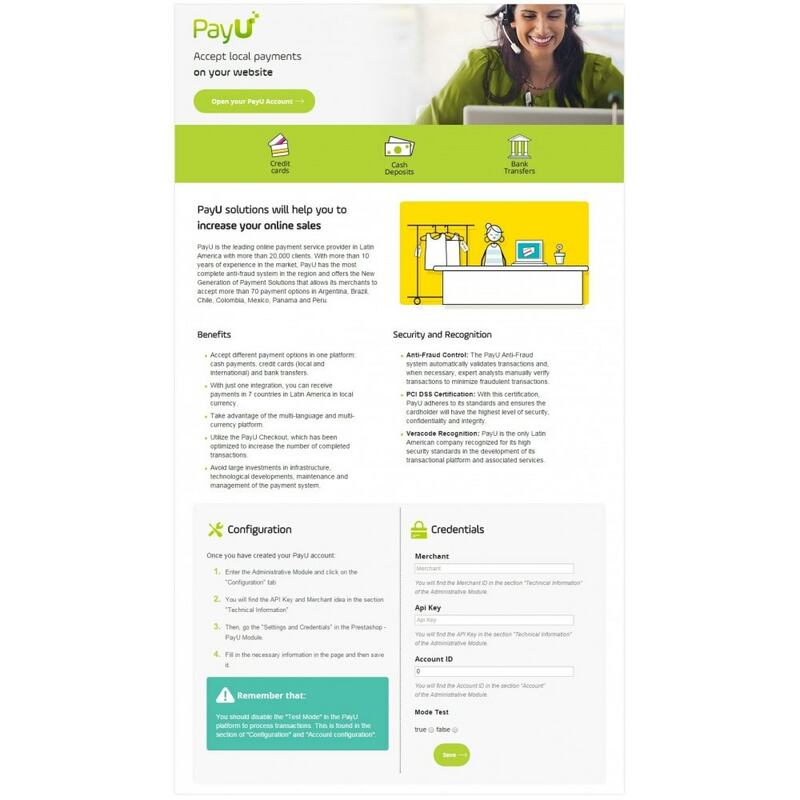 PayU Latam is the leading online payment service provider in Latin America. Over 20,000 merchants use PayU Latam to accept local payments in Argentina, Brazil, Chile, Colombia, Mexico, Panama and Peru. 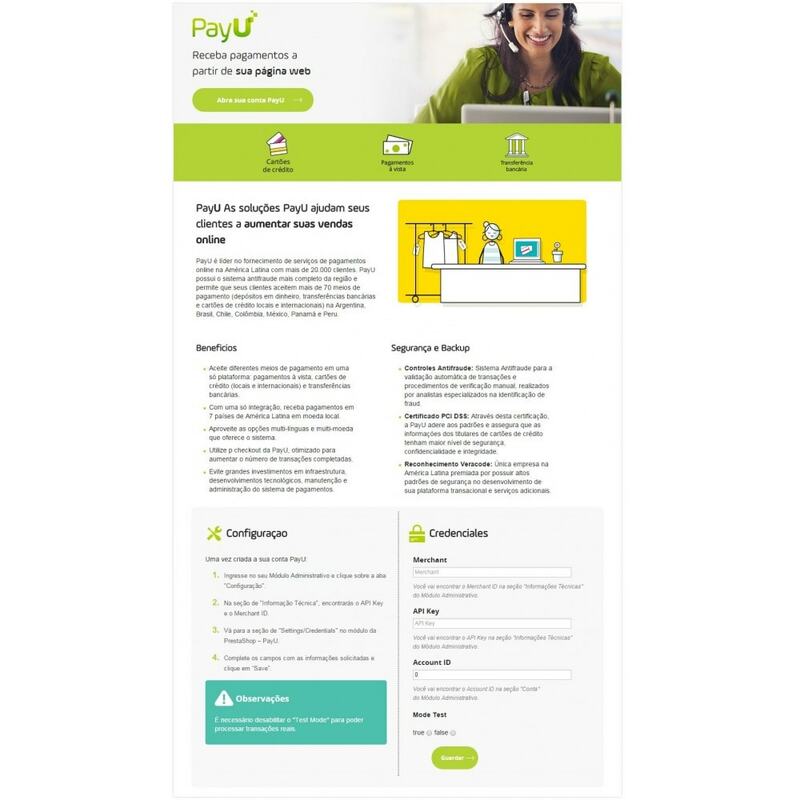 PayU accepts over 70 payment options including cash deposits, local bank transfers and local and international credit cards to reach the entire Latin American market. - With this information, go to the "Settings" in the PrestaShop PayU Latam module and fill in the required fields. - Press the "Save" button. * this mode should never be active in production for real transactions.